For the last few years I have been trying to do more hands on type of learning and less lecture but the content lectures always seemed to push the activities short. Since I was turned on to the flipped classroom my teaching world has been radically changed. Now all these ideas and activities can now become a more focal part of classroom time. One activity that I have done in my traditional teaching as a " break" from lectures can now be used as a more useful teaching tool. It is pretty simple and honestly I got the idea from someone else so I cannot take the credit for this simple idea. Basically this activity works best when you have a list of things for students to learn. I use it primarily as a tool to present a large list of suicide warning signs. 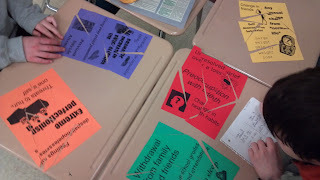 What I did was take the list and broke it down into groups of 4 and put those 4 on one sheet of colored paper. I did this with each set of 4 things. I ended up with about 5 sheets (20 things total). I put each set of 4 on a different colored sheet of paper and then cult each up into about 8 pieces thus creating a puzzle. 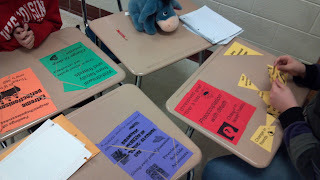 I put all the pieces into an envelope and give to a group of students to put together. 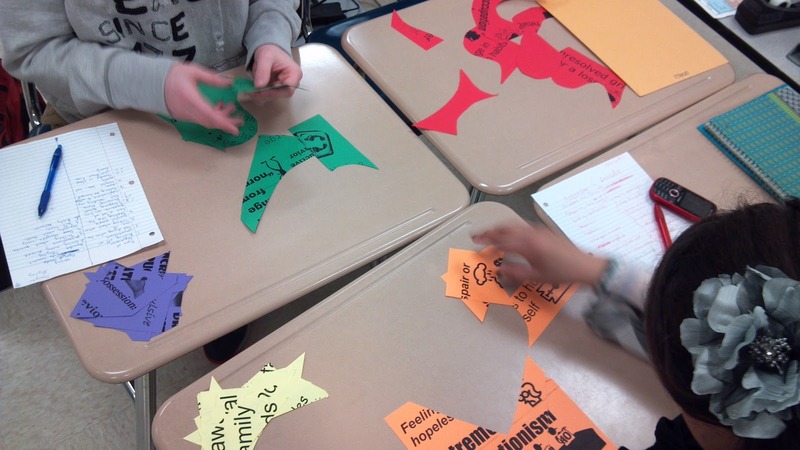 Once each puzzle is out together, the students then copy the list down in their notes. It is just a quick, entertaining, simple way to get students engaged in and write down an otherwise meaningless list of "things". We are in the middle of our suicide/depression unit. The students have watched a video in class about a true story of a boy who was depressed and suicidal and eventually committed suicide. What the students were to do during the video is identify any warning signs they observed in the video. We have not talked about these warning signs yet so I am seeing what they already know and allowing them to see that they have some intuition when it comes to identifying risky behaviors. The following day I break them into groups and hand out an envelope with the puzzles. They put the puzzles together and copy down all the actual warning signs in their notes. Then they check off all the warning signs they noticed in the video the day before by comparing their lists with the notes they just took from the puzzles. I then ask the groups to report on what warning signs were clearly present in the video. Here you could even incorporate a white-boarding activity as a way to have students identify lists or themes from the video. (See white-boarding). I usually have just done a Q & A but I am looking to integrate the whiteboard idea or even a google doc? The kids seem to like it because it allows them to work together, accomplish a task and write out a simple list. The kids also shift their attention about every 20 mins so it makes the class go quicker. It is a cheap, easy and quick way to get kids to copy a list in their notes and not feel like they are just copying stuff down. You can make this strategy work for just about anything. Give the note puzzle a try and see how you like it. 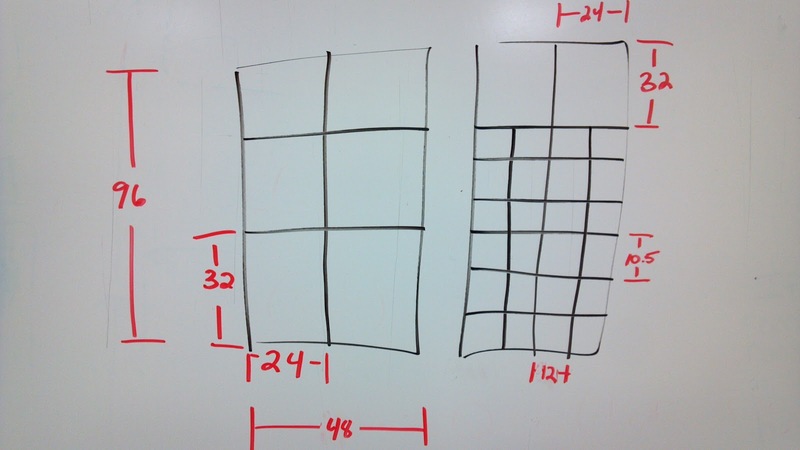 I have been reading some articles and blogs on white-boarding. It seems like a pretty simple concept and it reminds me of the old school slates that the one-room school houses used to have. Each kid would have their own slate and chalk and could write their answers on the slate to show the teacher their work. I see the white-boarding idea as the same thing. I have tried a few different activities with the whiteboards and it has worked pretty well. 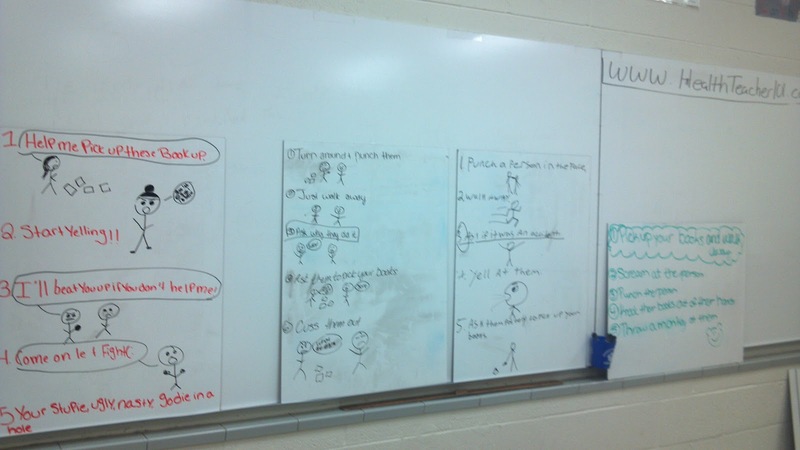 It is pretty simple; you give a group of kids a whiteboard and let them go. It is a quick, unique and easy way to have students and/or groups of students answer questions, draw examples, demonstrate knowledge or apply material. 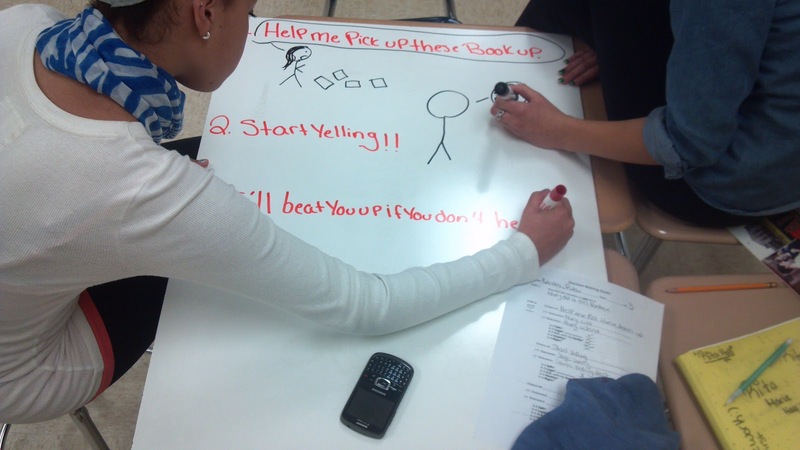 I love to have the students use pictures and symbols to answer questions too. They love using the dry erase markers and write on these big sections of whiteboard. Whiteboards are easy to erase and totally reusable. 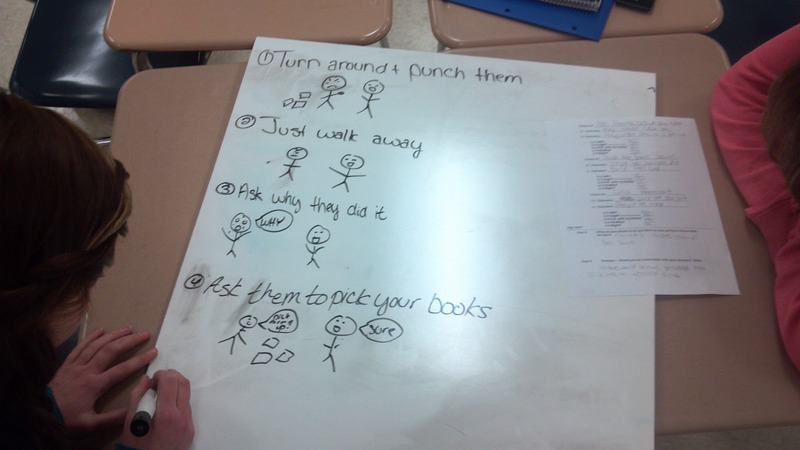 Here is an example of an activity I did in class just yesterday. We have been learning about emotional management and have been learning skills to act “different” when we get angry, frustrated, anxious, etc. The skill we are working on is Decision Making. They have already seen a vodcast on the skills and we watched a clip from “According to Jim” from youtube (see “Using YOUTUBE to help YOUTEACH”). Now we are looking at making good decisions. The white-boarding activity can be used for lots of different things and it puts the creating in their hands. Instead of me at the front writing things, they can be doing it at their desks in pairs, groups or individually. You can use it for review games, content games, graphic organizing, Pictionary activities, etc. The sky is the limit. Having a quantity of markers is a plus but even one color is fine. The kids just like doing stuff on the boards. Here is where you see your art kids shine in class!! Give White-boarding a try. You are only limited to your imagination. I’m sure all of us that are using technology and conscious of the Flipped Model are more than familiar/comfortable with youtube. I know there are lots of other video platforms out there like Vimeo, Schooltube, etc … I am using youtube because it is what I am most comfortable with and it is not blocked by our school district ;-). I also go right from youtube not from downloaded sources and the clips are short. I am not trying to "watch a video" but merely using a short clip as a means to create deeper understanding or a discussion point for class. Using video clips can be great visual and conceptual tools for a lesson. I use them all the time for “case studies” in my area of health education. I am amazed at what is out there to use as supplemental clips to aid in discussion, demonstrating a point, connecting a concept, etc. it sometimes is as simple as typing in a situation to search and viola … you’ve got a bunch of clips to choose from. You can pretty much use youbtube just like a search engine or even use a search engine's video search. I simply type in a show I think would work and some buzz words like "Big Bang Theory Breakup" "According to Jim Anger", "Seinfeld Gonnorhea" and see what shows? Sometimes you can click the similar links that pop up and guide you to a perfect clip somewhere else. Try to be as specific as you can in the title to narrow a search. Now obviously there is a lot of inappropriate stuff out there so I would never blindly pull up a clip and show it in class. Also beware of student suggestions on-the-spot too. Many kids will say “Oh, pull this video up it is perfect for this situation.” Their view of school appropriate and an adults’ view of school appropriate are WAAAAAY different. I am all for student suggestion but I definitely preview before I present. I have been burned on that one before!! Here is an example of how I used a clip from “According to Jim” off of youtube to illustrate a point about emotional management. First, the students have watched 2 vodcasts about emotional management. Vodcast 2.1 talks about how the brain processes emotional stimuli (Amygdala & Pre-frontal cortex) and Vodcast 2.2 talks about the 6 skills for reacting better (Recognizing A.N.T.s, Using diffusers, Compassion, Decision making, communication & relaxation). We have talked in class a little about the concepts of the A.N.T.s (Automatic Negative Thoughts) & Diffusers. I then play the clip and have the students answer questions either on paper or in a google doc connecting the concepts from the vodcasts, class activities and the clip. I love using popular TV sitcoms because they are usually well known, funny, and usually accurate in some exaggerated spectrum. Seinfeld, although dated, provides many good life lesson clips!! I also like “the Big Bang theory” especially in dealing with communication & relationships. There are a ton of shows out there but those have been a few I really like. PSA’s are also great to find too. Usually short but very powerful (“this is your brain on drugs … any questions”) we tend to remember those!! In a classroom setting, I simply pull the clip up in class and we watch it together, but you could easliy link the video off of a website or moodle and have the kids watch it and answer the google doc questions in small groups or individually. Lots of options here. Here is the according to Jim clip and the According to Jim google doc with questions I use. Give some clips a try to make your content a little richer and open up those classroom walls to the world.